These sides mounts are available in plated and stainless steel (SS24) versions The plated version is made from cold rolled steel finished with chrome plating. The stainless steel model is preferable if you are concerned about long-term durability or live near salt water. There are two options for studs with this mount The SO239(K24A) stud has a screw on connector for coax that has the big PL259 connector on it. The lug stud has a bolt on the bottom for connecting a hoop, lug, or Fire-Ring connector when stace is an issue. The choice is mainly personal preference. 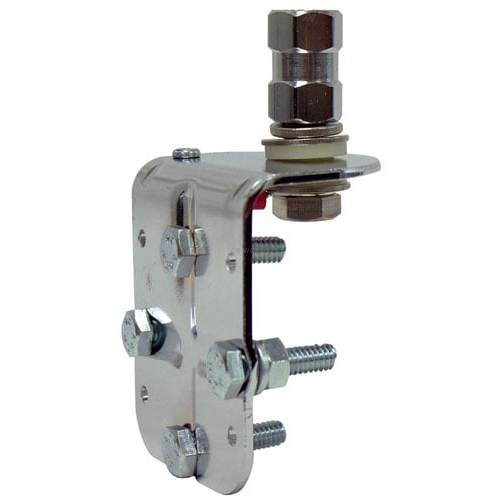 The lug stud will give you lower clearance, Terminal coax or FireRing coax is recommended.